First time on this forum ! I'm working on ATC listening project and I'm a bit struggling with quality ! Is there a way to improve the quality ? Antenna, settings... ? Any ideas are welcome ! I'm using a RTL-SDR cheap dongle with the AM/FM antenna on my roof. Listening VHF marine traffic is achieve with a great quality. I would suggest you try SDR# and see if you can get better results there. Perhaps it won't make a difference with your dongle, but with the AirspyR2 the choice of software CAN make a big difference. 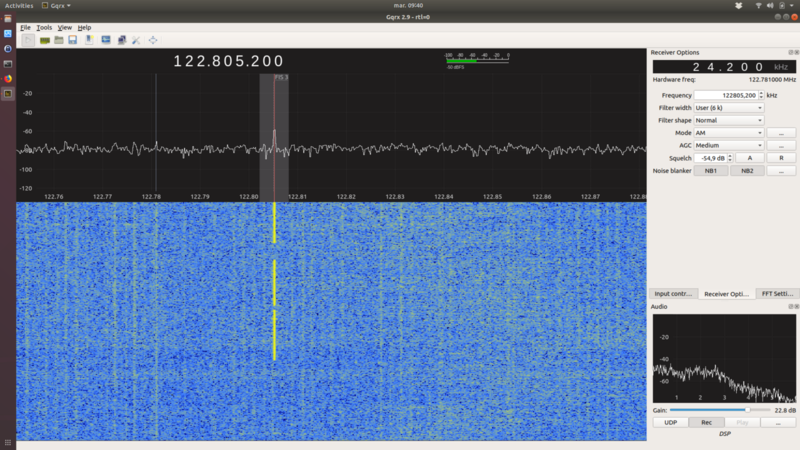 I personally get much better aviation-reception with SDR# than SDRangel. If passing aircraft (aircraft relatively close to you and/or at high altitudes) are loud with your current software and setup, then there is probably not much you can do. Ground-stations are usually harder to pick up than aircraft at altitude. Build a proper antenna. Either a dipole or quarter wave ground plane sized for the airband.